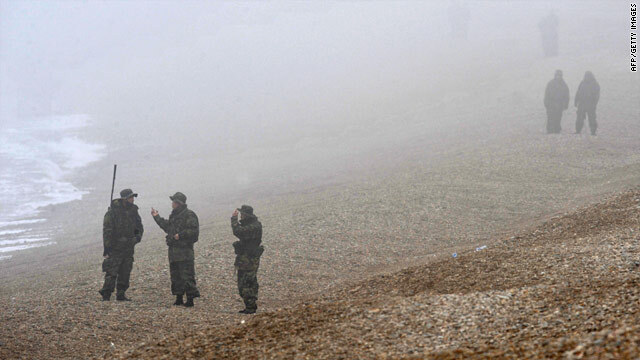 South Korean marines search the shoreline for possible survivors and bodies from the sunken warship on March 31, 2010. (CNN) -- The South Korean military suspended its search for missing sailors Wednesday because of high winds spawned by stormy weather, the Yonhap News Agency reported. Searchers have been looking for 46 missing sailors from the 1,200-ton ship Cheonan, a naval ship that sank Friday in the Yellow Sea near the maritime border of North and South Korea. Fifty-eight crew members were rescued, and the intense search led to the death of a military diver and the hospitalization of two others. Yonhap reported that divers have injected "air through a crack in the stem of the 88-meter-long corvette, hopeful that the latter section of the ship, about 45 meters underwater, is holding crew members alive." But high winds and strong currents have been working against the rescue effort. "We are temporarily suspending operations. We cannot expect to get near the ship in this condition," defense ministry spokesman Won Tae-jae told reporters. Military officials say an explosion tore a hole in the rear of the ship, but the cause of the blast is not known. South Korean President Lee Myung-bak has called for a thorough investigation into the cause of the explosion, and the country's defense minister, Kim Tae-young, has raised the possibility that one of the many North Korean sea mines placed during the 1950-53 Korean War could have triggered the blast. He said the military was "trying its best" to find survivors and that the cause of the incident will be made public "at the soonest possible time." 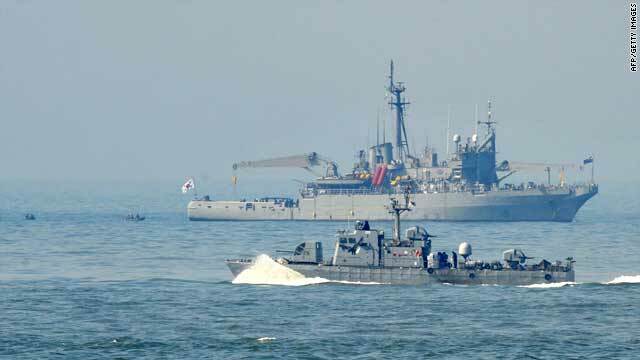 The navy plans to salvage the vessel, which was carrying missiles and torpedoes, to determine what caused the incident, Yonhap reported. Kim said work to hoist the ship above water could start next week and he said the government is mulling the formation of a fact-finding group to look into the incident. "We will explain anything to answer questions and address rumors concerning the incident," Kim said. "We have nothing to hide and no reason to hide. So many lives are involved in this case." Monday evening was the end of a 69-hour window during which rescuers believed the sailors could survive. Divers have knocked on the hulls of different parts of the ship with hammers, but raised no response. Baengyeong Island, the Seoul-administered island near the scene of the accident, is a flash point maritime border area between the Koreas. Given Baengyeong Island's proximity to North Korea, North Korean involvement had been feared, but South Korean officials have continued to play down that scenario. North Korea's official media has yet to mention the incident, according to Yonhap, but accused the United States and South Korea of conducting a maritime drill for the purpose of invading North Korea.